Dr. Emilio Justo with patients at the Sun City West office. The Arizona Eye Institute & Cosmetic Laser Center is a leading provider of plastic surgery, nonsurgical cosmetic enhancements, and ophthalmological treatments. We have been serving Phoenix, AZ, for nearly three decades. Our goal is to provide our patients with outstanding personalized care that leaves them looking and feeling beautiful, healthy and rejuvenated, along with providing world-class medical eye care and vision restoration. When it comes to plastic surgery and eye care, you want a surgeon who is an expert with years of experience and a mastery of the most advanced procedures available. Our founder and medical director, Dr. Emilio M. Justo, has made a practice of adopting the safest and most precise tools and techniques in order to provide the best care for his patients. However, the most sophisticated treatments in the world are not effective without the individual connections and careful listening that are at the core of our philosophy. It takes a genuine and compassionate partnership between doctor and patient to actualize goals and create an overall positive experience. We are proud to announce that Dr. Justo has been named one of 2012’s “Top Docs” in the United States by Plastic Surgery Practice for the third year in a row. Dr. Justo has gathered a team of compassionate specialists including our accomplished and personable Director of Optometry Eugene Shifrin, O.D., F.A.A.O., and our Assistant Director of Optometry Manuel Zambrano, O.D., to help our patients realize their goals. 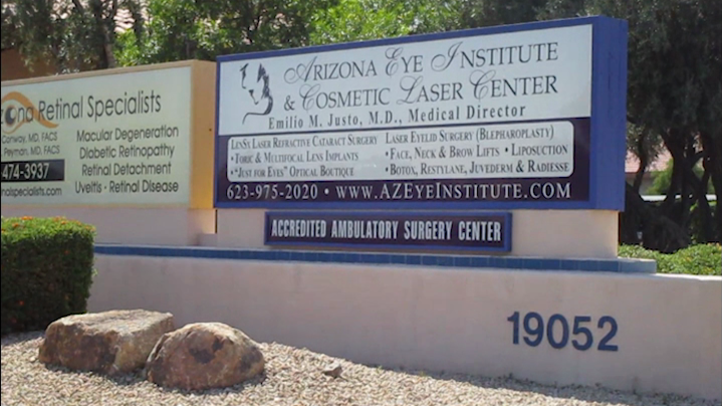 Come find out for yourself why so many trust their care to Arizona Eye Institute & Cosmetic Laser Center. We have assembled a team of carefully selected professionals with the skill, experience, and compassion to help you reach your goals. By undergoing eyelid surgery at Arizona Eye Institute & Cosmetic Laser Center, Patricia regained her confidence, a youthful appearance, and her ability to drive at night. Emilio M. Justo, M.D., established the original eye surgery practice, which expanded into a leading plastic surgery and ophthalmology institute in the Phoenix area. We now have three facilities in Sun City West, Sun City, and Wickenburg, including an outpatient ambulatory surgical center at our Sun City West location. Our practice uses only the most advanced technology and techniques administered by leaders in the fields of plastic surgery and ophthalmology. While Ted's main concern was his range of vision, we also helped him achieve a much more alert and awake appearance. Patients from throughout the years have left us stories of their dramatic transformations, and expressed their gratitude for their restored vision and appearance. We invite you to take a moment to browse through our patient testimonials and reviews.